Keep kibble fresh with Petmate’s Ultra Kibble Keeper. 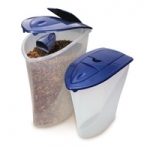 Features durable, eco-friendly plastic and an extra wide-mouthed lid allowing for easy access. Created with Microban® antimicrobial protection to fight the growth of stain and odor-causing bacteria, mold and mildew. Available in a variety of sizes.